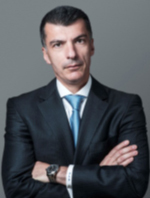 Mr. Antonios Kerastaris is the Chief Executive Officer of the INTRALOT Group and an Executive Member of the Board of Directors. He joined the INTRACOM Group in 2008 and prior to his current position he was INTRALOT Group Chief Financial Officer since February 2014, Chief Executive Officer at hellas online between August 2009 until January 2014 and Chief Financial Officer at hellas online since April 2008. In his 21 years of working experience he has held a number of senior management executive positions in large multinational companies such as Procter & Gamble, Hilton, Mercedes and OTE Group of Companies. Mr. Kerastaris holds a degree in Business Management from the Athens University of Economics. He is married and father of two children.